On a given February night in 1939, an entertainment-seeking Lewiston resident could sit at home and listen to Death Valley Days on the radio. Or he could take in a movie, like The Adventures of Huckleberry Finn, starring Mickey Rooney and Walter Connolly, at the Empire. And if their appeal was nil? Well, how about the science show at Bates? True: A big public event in Lewiston during February 1939 was likely the Biennial Science Exhibition. That year’s edition attracted more than 2,500 visitors, including many residents and high school students, during its two-day run, Feb. 23–24. 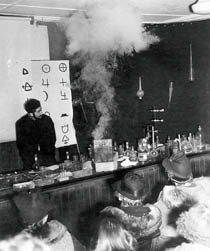 This photograph from the Muskie Archives and Special Collections Library shows future pharmacist Ed Scolnik ’39 in Hedge Hall, then the home of the chemistry department, performing chemical mischief during a skit called “A Night of Alchemy” (hence the alchemic symbols on the sheet behind him). Bates still offers a public exhibition of student wizardry in the form of the annual Mount David Summit, a showcase for students who have both mastered their sometimes-obscure areas of study and can explain their work, too. But at least when begun in 1918, the goal of the Science Exhibition was mostly to “show…the facilities available at Bates for scientific work,” in the words of a Bates Student story. Indeed, the Student’s long story mentions a slew of exhibits — a live albino Flemish rabbit, partially dissected cats, and an X-ray demonstration — but names not one student, despite the event’s sponsorship by the student scientific organizations. “Science and technology exhibitions — the 1933 Chicago World’s Fair being a leading example — were a big deal at the time,” says Rebecca Herzig, an associate professor of women and gender studies whose expertise is in the intersection of science, society, and identity. Our fascination with (and anxiety about) science and technology, she adds, “has only continued to deepen.” By 1951, exhibition presentations would explain the Androscoggin River’s odor, cancer mutations in mice, and synthetic fibers from the Bates Mill.